Welcome to the Morton Family Cabin ! View of the home as seen from the street in winter. 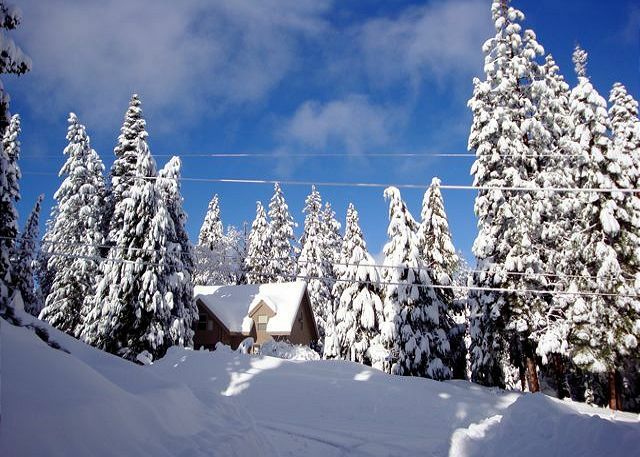 The cabin is nestled amongst large trees in a picturesque setting at 5,000 feet. There is a lovely patio area that is fabulous for sitting and enjoying the peaceful setting where the cabin is located. This home is FULL of windows in every room. 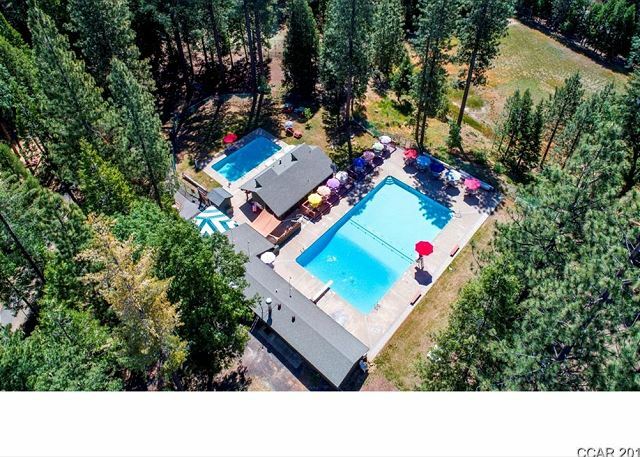 Guests have full FREE use of the Big Trees rec center and pools. Playground at Big Trees rec center. The rec center also has fun games for all ages. The living room is a comfortable and spacious room with a beautiful stone hearth and propane fireplace and an impressive log beam. Open, light and inviting describes this home. The river rock fireplace is a wonderful focal point to cool evenings. Plenty of seating for your entire group. This kitchen is a cook's paradise. There is tons of counter space, an open floor plan, and it is stocked with just about anything you could possibly need. Extra large kitchen island with plenty of seating. The dining room has a large table that is perfect for big family meals. Imagine preparing a holiday meal with this as your view! 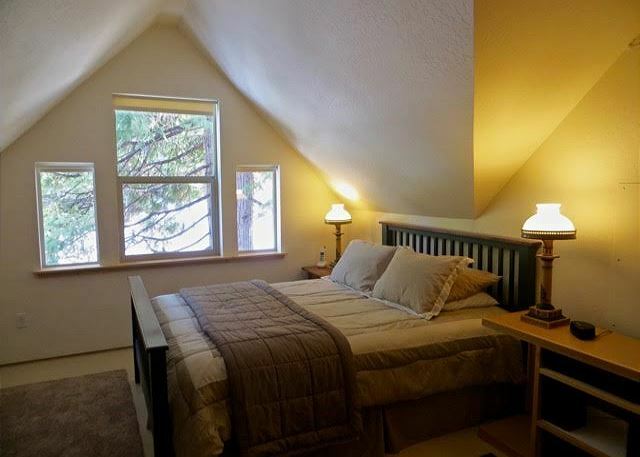 Master bedroom is upstairs with queen bed and unique dormer features. 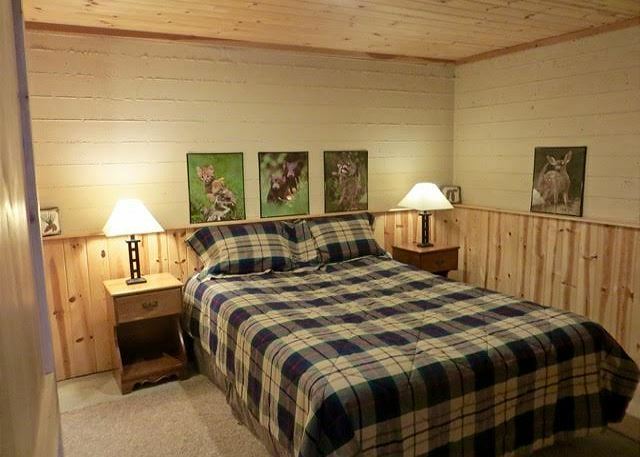 The second bedroom located upstairs has a queen sized bed with a fun cabin theme. 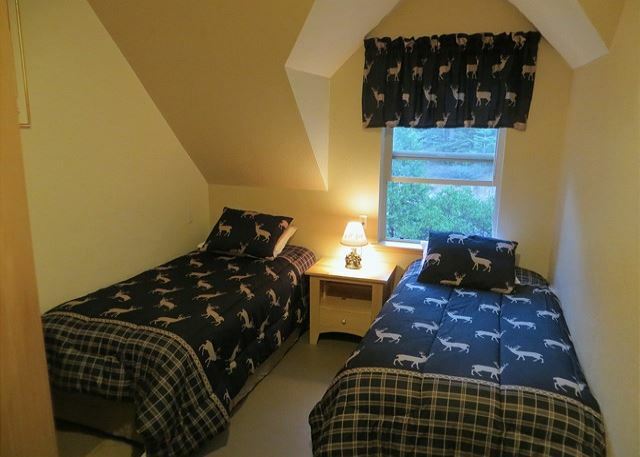 The third bedroom is also located upstairs and has two twins. 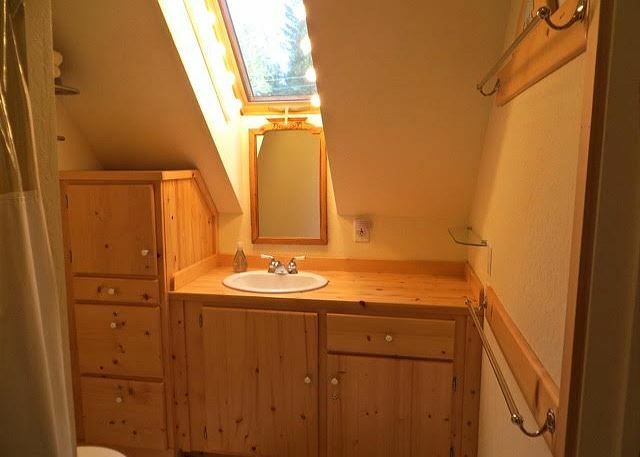 All bathrooms also have beautiful wood cabinets and accents. The 4th bedroom is located on the lower level off the rec room. It also has a queen sized bed. Built in cabinets are throughout the home. The lower level bathroom also houses the laundry facilities. Lower level game room has a TV, foosball table and more. ALL CABINS HAVE A HOUSEKEEPING CHARGE AND COUNTY TAX IN ADDITION TO THE RENT. 3 Night Minimum During Holiday Periods. GORGEOUS cottage style cabin with easy access driveway that is nearly level to the front porch and entry. Wood and logs throughout this bright 3 story home. 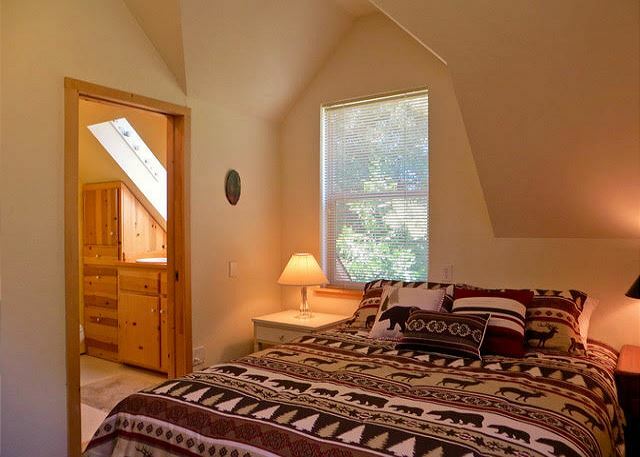 Lots of privacy with many bright windows that frame views of the forest and sunset colors. Open plan main level has light pine interior wood, locally milled log accents, and large river rock fireplace with heavy cedar log mantle. Pine cabinets throughout. Kitchen is located at the heart of activities with a big oak countertop island for food prep and additional seating. 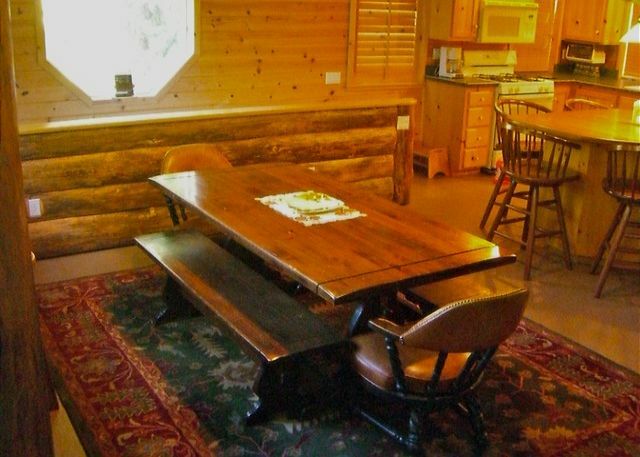 Table area has a unique log slab snack bar with additional stools at the window. 46 inch HD TV in living room. 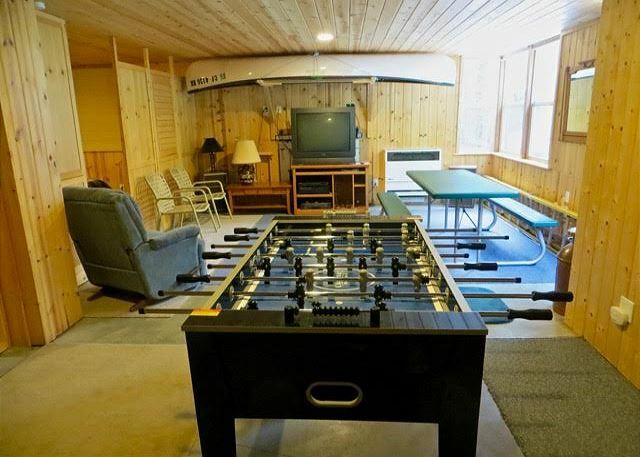 Downstairs recreation room includes TV, foosball table, table with board games, and a stereo with iPod input. Bedrooms and bathrooms are arranged to be essentially 3 master suites, with queen-sized beds, and another bedroom with two twin beds. Three bedrooms on the top floor and one on the lower level off the rec room. Outdoor living area adjacent to main level has cobble stone type surface, wooden patio furniture and a charcoal BBQ (Guests should bring their own charcoal). 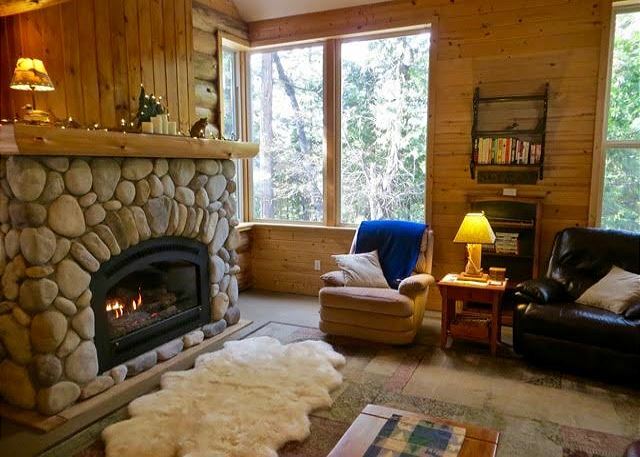 This is an ideal getaway cabin for several couples or an extended family. NO SMOKING. For summer use, this cabin offers FREE guest use of Big Trees Rec. Center and pools. 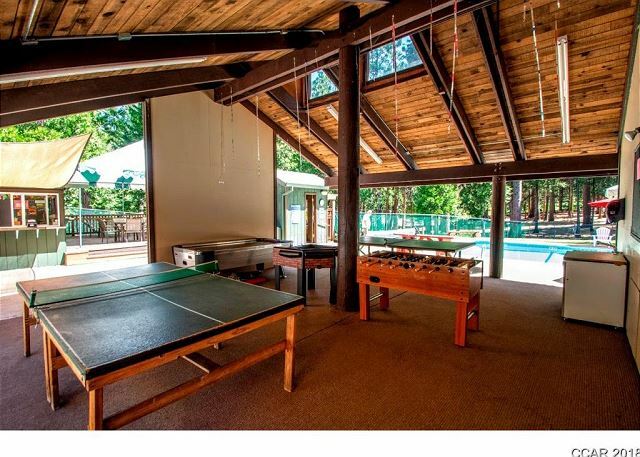 Check out facilities & activities at http://bigtreesvillage.org/recreation-center/. WELL BEHAVED DOGS ALLOWED UPON APPROVAL, additional fee will apply. Now featuring high speed internet and Verizon cell reception! Please return to stay with us again. The Morton cabin has become our home away from home. It is well equipped and most comfortable. We can’t remember how long we have rented it but know it is well over 10 years. My family and I have been coming up to the Big Trees since 1975. A super vacation rental. Thank-you Sorenson Family for your continued return to the Morton cabin as our guests. This is a wonderful cabin for a sierra get-away!! Hope to see you next year! We thoroughly ended ou short stay at this cabin. We were a group of eight, so we appreciated the well stocked kitchen and the spaciousness of the interior. There was also lots of seating, which you dont always find. The cabin is very nicely decorated also, which made our stay all the more enjoyable. I would definitely recommend this cabin for either small or larger groups. The kids also enjoyed the game room below. We would certainly like to stay in this cabin again. We are so glad you enjoyed your stay at the Morton Cabin and hope you can come again soon. Beautiful, want to come again! 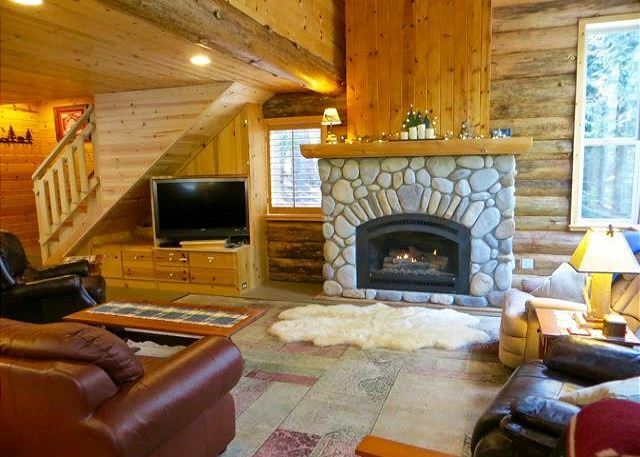 Beautiful cabin, very well stocked and in perfect location. The driveway is even, which is so good for parking, yet there is a small hill on the other side of the house that kids can use for sledding. Gas fireplace warms the house very quickly, and foosball table downstairs is indispensable! The only thing we got a bit concerned about was the smell of gas each time we turned on the stove, it did go away shortly after - probably to be expected with the gas tank? Otherwise no issues. House is beautifully decorated, thank you very much for an opportunity to stay there! Glad you had a great visit. 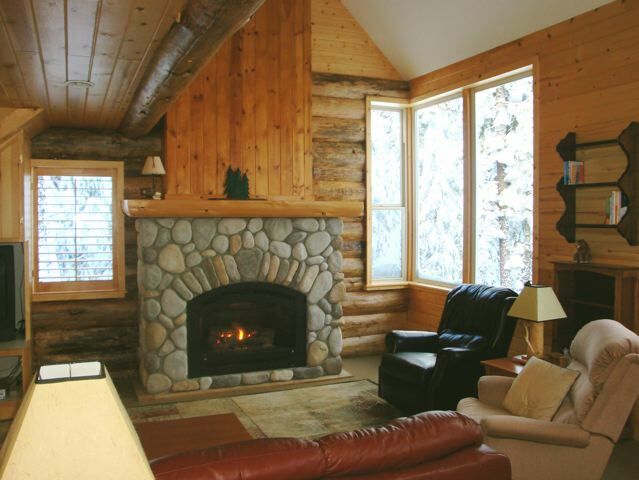 This is a wonderful, comfortable cabin enjoyed by many guests returning year after year. The gas stove is fine with no problems, just the initial start up smell. Thank-you for coming to stay with us in the sierras. We look forward to you returning again to enjoy all that the beautiful sierras has to offer. We have visited Big Trees for years now and love the place. This is a really nice cabin that fit our family really nicely. The room are clean and comfortable with modern cabin look and feel and amenities. The driveway is easy to pull into which is a must in the winter months. We will be back. We rented this cabin to be around the corner from my in-laws for their 50th anniversary and Thanksgiving. The cabin is clean, well equipped and very spacious. We had two families staying and felt very comfortable. The only thing I didn't like was having to provide our own linens and towels. I think that those should be a given and be absorbed into the price of renting. We were expected to do so much of our own cleaning before leaving that I can't imagine washing sheets and towels would be that big of deal. We had the choice of bringing our own or paying more for cleaning. That's kind of dumb. But that's my only gripe. Otherwise, lovely place! Unfortunately there is no linen service in the sierras. Sorry. The cleaning contractor fees are standard to our area and they will charge more to provide linen services or extra cleaning. Our guest check out list is simply asking our guests to leave the house in the same respectful condition it was received. The housekeepers clean and sanitize the house after guest stay but are not expected to clean guest dirty dishes, or to pick up toys, trash or games that have been left out or scattered. This is the 2nd summer our family has stayed at the Morton Family cabin. Especially enjoyed the rec center swimming and water polo, super fun! Hiked Big Trees again (sorry the drive thru tree is no longer there), Alpine Lake picnic and swimming. Trip to Murphys, again more swimming, wine tasking (recommend Mineral Wines, Sevenot). Lots of fun packed into 4 days!! Suggestion - replace the mattress downstairs in the rec area. Great time in Dorrington at the Morton Family Cabin! We enjoyed our stay at the Morton Family Cabin in Dorrington . The description was accurate, the cabin was clean and the kitchen was well stocked. The area is beautiful! Our two grandsons loved the rec area with the two pools and park. Anne with the property management company Big Trees Real Estate was wonderful. It was a great experience. We will definitely stay here again. Thank-you! We would love to have you return to stay with us again. We loved our stay in Big Trees. Thank-you for returning again to stay with us Donna. So glad you had a nice time. Our sierras have it all! We stayed in February, a family of 4 with a dog, and had a great time. House is well stocked, the gas fireplace warms up entire place quickly and layout is very comfortable. All those little details that owners so thoughtfully put in place make a vacation very relaxing. Kids had a blast sledding from the hill right next to the house. Thank you! Thank-you! So glad you enjoyed your stay. We look forward to you coming back again. I have stayed in this cabin a few times on retreat with brothers from my church. Great layout, with a large living room, picture windows, and an open floor that connects to the kitchen and dining area. Kitchen is well-stocked and powered by gas. This would make a cozy home base for anyone who wants the comforts of home while being in the woods and near Bear Valley, etc. Lights, music and heat on to welcome guests upon arrival. Very comfortable vacation home. We live in area and needed additional accommodations for family during holiday. We are glad we were able ot help make your family holiday special. Thank you for letting us know. We had a wonderful experience, beginning with reserving the house through Sierra Vacation Rentals. Maureen was helpful, and informative. I felt cared for individually. She took all my needs into consideration, and helped me select the best house for me to rent. We loved the house! We loved the clubhouse, we had a wonderful time! Thank-you. This is a great cabin! Please come back to stay with us again. We have been renting this cabin for 6 years in the summer and fall. Love the location, the community and all the fun stuff to do nearby. 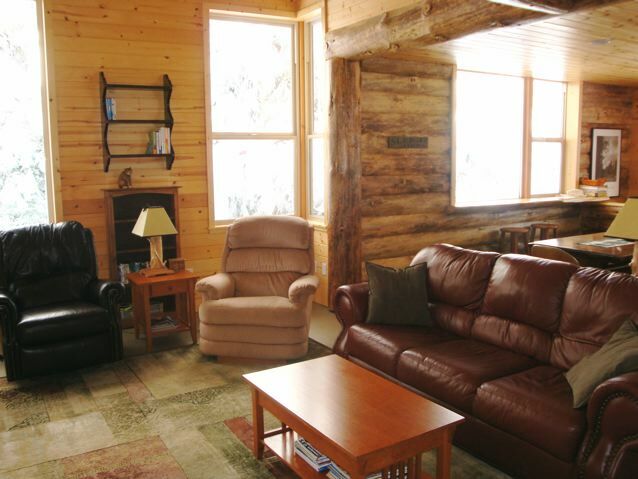 The cabin has open floor plan with spacious rooms and a fantastic kitchen/great room combo! The best part is when we arrive the ambiance is already set waiting for us. Thank you for your continued customer service and attention to details ???? Wonderful 4th of July in Big Trees! We had a great time at the "Morton's" - perfect house for several of us, our kids, and doggies!! We were two families with small kids, it was perfect. Really impressed with property management company. Thank you for your review! We are glad you enjoyed your time at the cabin and our services. We hope to see you again in the future! We rent houses a lot and we tend to be hard-to-please. This house, however, fulfilled all our wishes! From the nice kitchen to the comfortable beds to the fooseball table, we felt totally at home. The yard provided endless snow fun for our kids, who were content to sled down the backyard hill for hours. Although Arnold had sparse snow, Dorrington was thick with it, a necessity to our snow-deprived, Bay-Area children. Thank you for your review! We are so glad you enjoyed your stay here. The Morton cabin is certainly hard to dislike. From the spacious floor plan, 4 bedrooms, large, open kitchen, level driveway, beautiful interior, and meticulous maintenance by the owners, this is one of our most popular rentals and a favorite amongst the staff. We are glad you loved it as much as we do and hope you will come back and stay again! Love the cabin. Been going for years and it feels like a second home to us. We are glad that you found a cabin that works for you and your family! Thank you for your continued business! We have been coming to the Morton cabin for many years. My granddaughters LOVE the rec and this year they went horseback riding as well. The cabin is super well equipped and very well maintained. The Morton cabin is one of our best rentals. We are so glad you enjoy it enough to come back every year! We look forward to seeing you during your next stay. Great place to stay, wonderful location, the property was clean and nicely maintained. We enjoyed our time! This is our 7th year at the Morton Cabin. We all feel like it has become our second home. Very well stocked with anything you could want. Nature's beauty cannot be beat! The Morton Cabin certainly is a guest favorite. Lots of extras, a beautiful setting, and a beautiful interior make it a very special retreat. We've been staying at this cabin several years in a row now. It's a great place for the whole family. We had an exceptional time, cabin is very nice and accommodating. Rental experience was as well exceptional. Linnea Sword is amazing. She was extremely helpful in suggesting the right rental property for our needs. She went above and beyond to make sure our experience was the best. Extremely responsive and efficient!!! Thank you for your review and kind words! We do our best to make each guest's stay a fun, enjoyable, and memorable experience. We hope you'll come visit us again soon! great size, air-hockey table so useful for keeping the 4-yr olds entertained. Fully equipped home. Grandchildren love the Rec Center ages ranging from 15 to 3 year old twins. Lots to do to keep everyone happy. The house had a nice flow, allowing the kids and adults to move around comfortably. The main floor was especially inviting and encouraged great conversational seating (large island with chairs, as well as long dining table with benches). I couldn't get the guys off the leather recliner in the living room because it was so comfortable. The kitchen was well-stocked with utensils and had a ton of entertainment to chose from for the family. Kids loved the air hockey table and watched movies provided by owners. Very clean and neat- not overly decorated and had a log cabin feel on the inside! Would be perfect if there was a deck or larger area for eating or hanging out outside.The outdoor sitting area is in front of the house by the driveway, while we would have enjoyed a backyard view of the surrounding trees. This cabin was great for 2 families with kids. The kitchen had everything we needed and there was plenty of room for us to eat together. The kids loved the games and the teenaged girls loved their own space downstairs. We can't wait to return next year. The Morton Family Cabin is a beautiful place to stay. It is spacious, yet also very cozy! We loved every minute and never wanted to leave. This is a great house with a nice open layout. It has big windows with forest views as well as a private sledding hill! The upstairs needs baseboards and wine glasses would be nice, but generally this is a great house. Unfortunately we had an issue with the driveway not being plowed, so be careful. driveway is plowed depending on snow fall. If ever a problem please call our office and we will gladly get the plow service out to take care of the problem. The cabin is lovely and in a beautiful location. The kids enjoyed sledding right outside. Our only difficulty was putting on chains to get up the road leading to the property. a practice run at putting on chains before coming to the sierras is a good idea. The cabin works great for our family. The layout gives privacy when needed. The location is removed from the main roads and there is plenty of safe areas for the kids to play outside. Another year of a warm, very well equipped home were we all were able to relax and really unwind. The Big Trees is my second favorite spot with the ocean being number one. Magnificent home in a peaceful setting. Clean, child/family oriented. Within 5 min. of downtown shopping, dining yet close to fishing, swimming, Big Trees, etc. 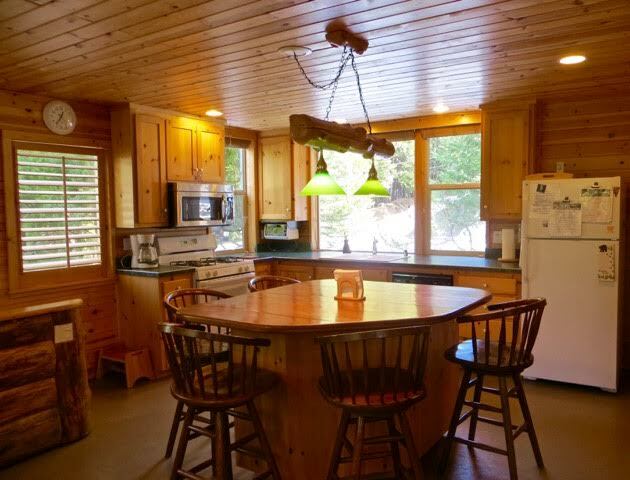 This was a great family cabin for congregating around the kitchen and living room. We love to play games and this was perfect. Cute cabin, close to Arnold but secluded enough so you can escape from civilization. Noisy fan but otherwise generally good. This cabin looks small from the outside but it's really quite roomy, clean and cozy. The fireplace is beautiful! We loved it there and almost felt it was a waste just the two of us staying there. It sleeps 8 in separate bedrooms - would be fun to go back up with a group but we'd go back either way. We spent 4 days at the cabin for Thanksgiving weekend. Just fabulous. The home was ready when I got there...heat, lights...very welcoming. Nice area and great customer service. We had the best time!!! Thank you. Cabin is very well equipped particularly the kitchen. No real big items just some irritating things to mention. The Weber was not very clean and the tools to clean the grill were very dirty. It would have been nice to have a bathroom on the main level. We did have ants invading the kitchen which made it annoying. The house fan helped cool the place somewhat but air conditioning would have been better. One last thing, not having cell service and not being able to dial out except for local calls was frustrating. Overall not bad the place was roomy and was able to room a fair amount of people. Lots of selections of games to play was nice. 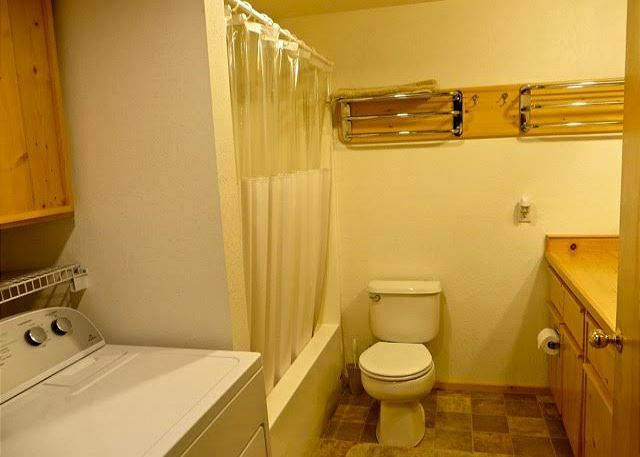 Unfortunately, we cannot add a bathroom to the main floor of this cabin. The cooler mountain weather makes air conditioning something that is rarely needed in the summer months. The nights cool off considerably with very few hot days/nights to endure. We do not have long distance calling from our cabins, this becomes too costly for our owners. Many of our guests use calling cards during their stay. The rental office does offer free internet use to our guests as well as long distance calling should calls need to be made. This is a cabin enjoyed by many new and returning guests. Let us know when the For Sale sign goes up! Wouldn't change a thing! The house just works for our family. Love the fact that once inside, your are in your very own tree house. We will be back! The cabin is beautiful. And the location was superb for our family get together. The hillside location made a perfect sledding run for the kids right outside the door -- and they didn't have far to go to warm up when they got cold. Was a beautiful cabin with great views! I was hesitant about a "fake" fireplace prior to going but was soo nice when we got there to be able to turn the switch and have a fire! Would definitely stay in this cabin again. Those who slept in the basement/ downstairs area wanted to make sure I mention the crazy amount of spiders! Don't know that anything can really be done about that though.... it is the mountains! We have been coming to this area for the last 25 years and this is the best equipped home. Thanks for sharing it with us. I have never rented another home which was as well stocked in the kitchen. There were ants on the sink which we think we eradicated. A bigger problem may be the carpenter ants we saw in the upstairs front small bedroom going into the bathroom across the hall. I realize these can be quite a problem in the mountains. We love the rec area! Grandchildren all went swimming and enjoyed the water polo! Great cabin,however, without carpet noise travels throughout, feels like hollow walls when it comes to noise. The kitchen is supplied with anything you could possible want, which is a big plus. Very comfortable! Only 1 issue that we had, our map provided to us had the correct address on it but the highlighted section showing how to get to the property was directed to the wrong location. It was getting dark so It was a little frustrating at first till we figured it out, as far as the cabin it was great, just need a nice patio area with better furniture so we can enjoy the outdoors more. It was clean, convenient and comfortable. Big Trees Realty personnel was very nice and helpful. We hit a hot spell and it would have been helpful to have shades in the family room to help keep things cool. 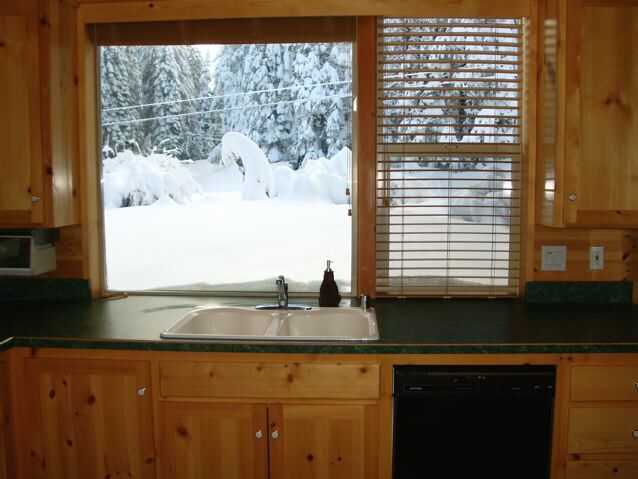 We've rented from Big Trees Vacation Rentals for years and have always had a great experience. The staff is very friendly and helpful and we've enjoyed staying in a variety of properties, the Morton Cabin no exception. Highly recommend for families! First, the house was beautiful and comfortable and we loved the location. The check-in/check-out times are a bit ridiculous. We rent vacation homes several times a year and usually the check-in/check-out times let you actually enjoy the house those days. With this house, we felt it was WAY overpriced for the little amount of time it was available to us on the check-in/check-out days. So, we requested an early check-in time and a later check-out time(otherwise we would have stayed somwhere else). The representative on the phone was very nice and accomodating. She changed our times and sent us our revised contract with the new times very quickly. But when we arrived, the staff in the office was unprepared, and not very helpful and didn't want to honor the revised times. We showed the contract and received the keys, but the staff at this point was not very nice. When we arrived at the house, there was a big bag of garbage in the kitchen and all the bathrooms were very dirty. The Morton Cabin was a wonderful get away for me and my family. 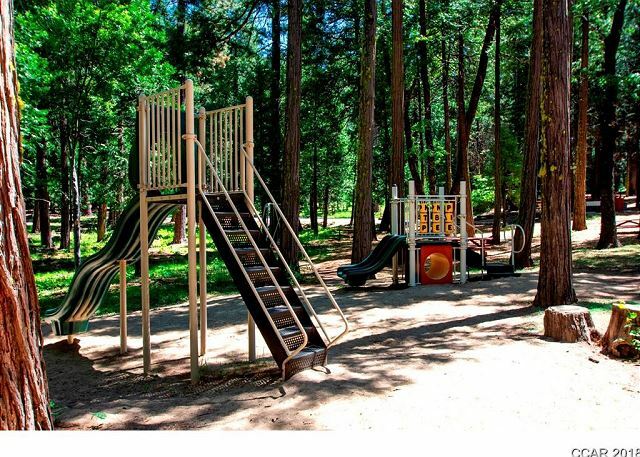 I grew up going to Big Trees with my parents and it is a great place to visit and my kids are begging to go back again as we had so much fun. We had ALL the luxuries of home and yet we were in a beautiful peaceful location. I would recommend this cabin to anyone who wants to stay in a secluded yet driving distance from everything!!! Thanks Again for such a great experience! !